Many states, including Washington, have enacted dog bite statutes that give specific guidelines for dog bite cases. In most cases, these statutes create a form of “strict liability” for dog bites. Strict liability means that the defendant is held liable if something happens, regardless whether they could have done anything to prevent the incident. The victim did not provoke the dog. If a dog bite occurs in a state with strict liability, it does not matter what the owner did or did not know about the dog beforehand. Unlike it most other types of personal injury cases, victims do not need to establish negligence in a strict liability dog bite case in Washington State. Some states require evidence of at least one prior incident — referred to as a “one-bite rule”— before an owner can be sued. This is not the case in Washington. Washington State dog bite law protects landlords from liability for their tenants’ dog-inflicted injuries, unless the landlord owns the dog(s). Many cities, towns and counties have their own laws and regulations regarding licensure and confinement of dogs. Check with your local authorities if you have any questions. According to the American Medical Association, dog bites are the second leading cause of childhood injury, surpassing playground accidents. 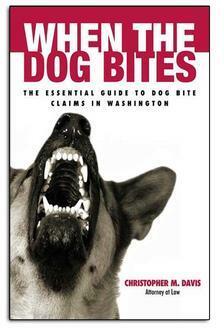 An estimated 4.7 million dog bites occur in the U.S. each year. In the US, approximately 100 children are bitten by dogs every day and approximately 92 of these children will need medical attention. One-third of all injury claims against homeowner liability policies are related to dog attacks. Seattle Animal Control sees about 300 dog bites each year. One out of five of those accidents involved pit bulls, even though only one out of 20 dogs in the US are pit bulls. Puncture wounds: These may not bleed a lot, but they are dangerous and should be treated quickly. They are prone to infection. Visit a doctor, clean the wound, dress the wound and take antibiotics. Infection: Dogs can be covered in untold amounts of bacteria, making a dog bite victim prone to infection. Redness, swelling, pus, tenderness and heat are all signs of infection. Facial scarring: In severe cases, victims are left with a lasting reminder of their attack. In 2012, more than 27,000 people underwent reconstructive surgery because dog bites. Nerve damage: Deep bites mean potential nerve damage in a person’s arms, legs, face or neck. Mobility can be affected. Post-traumatic stress: A fear of dogs and other triggers may happen because of a dog bite. If you or someone you know has been the victim of a dog bite resulting in any kind of physical injury, it is important to contact a dog bite attorney as soon as possible. Cases such as these tend to be fairly time sensitive, so the sooner you file your claim, the better chance you have at seeing your desired results. At Davis Law Group, P.S., we are here to help dog attack victims. Attorney Chris Davis and the legal team at Davis Law Group work to get you the money you deserve for your injuries. It will not cost you anything to have your injury claim evaluated by one of our experienced attorneys. After we review all your legal options with you, you will then make the decision as to whether you wish to proceed with your case. To schedule a free case evaluation and have your personal injury case personally reviewed by our award-winning legal team, contact Davis Law Group at (206) 727-4000, use the chat feature below or fill out the contact form on this page.